Opening Session – What Have We Learned? Symposium: Chasing Hunter-Gatherers and Early Farmers in the Great Lakes and Beyond – 45 Years of Research Dedicated to Understanding The Dynamics Between People, Environment, and Behavior: Papers in Honor of William A. Lovis. Session: Lightning Rounds – Engaging “Alternative Archaeology” in Three Minutes or Less! 1:00 William Lovis – Landscape Marking, the Creation of Meaning, and the Construction of Sacred and Secular Spaces: Rethinking the Birney “Mound” in the City of Bay City. Are you ready to Par-T? For my personal research I study issues related to health and disease, so whenever I see something health related in the CAP collection I jump at the opportunity to do a blog post about it. 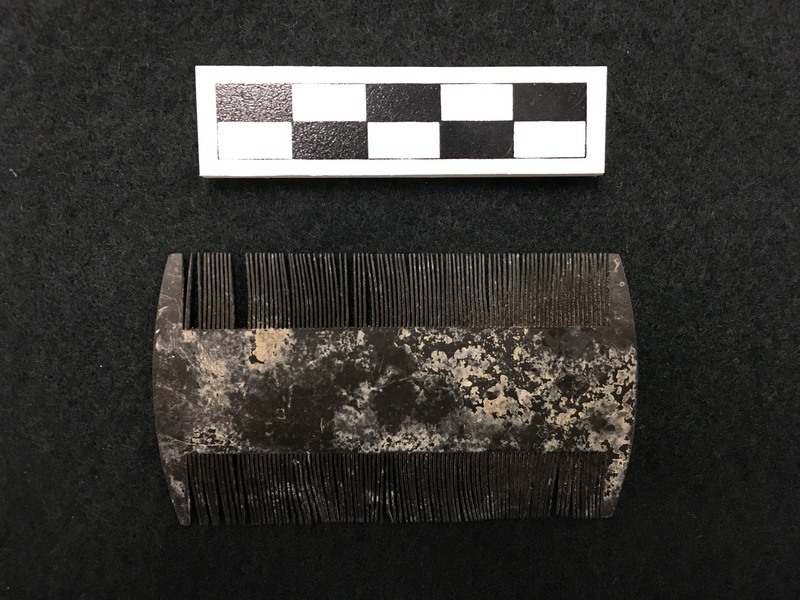 That happened recently when I came across this seemingly simple comb recovered from excavations at Saints Rest in 2012, but I knew immediately that this was more than an average comb, this is a lice comb. Comb recovered during 2012 Saints Rest excavations. Now I’ll give you a moment to stop your skin from crawling when you think about lice. While lice aren’t something we tend to think about regularly today (unless you have young children), that wasn’t always the case. Dealing with pesky varmints in the home and on your body was just a part of life. Lice have been bothering humans for a long time. Humans are parasitized by two genera of lice: one shared with chimpanzees and the other shared with gorillas. By using DNA to figure out when the lice diverged between the species, scientists are working to piece together part of our evolutionary history (Reed et al. 2007). Researchers have also looked at clothing lice to reveal when they may have diverged from head lice, giving us a better idea of when clothing when first used by anatomically modern Homo sapiens (Toups et al. 2011). 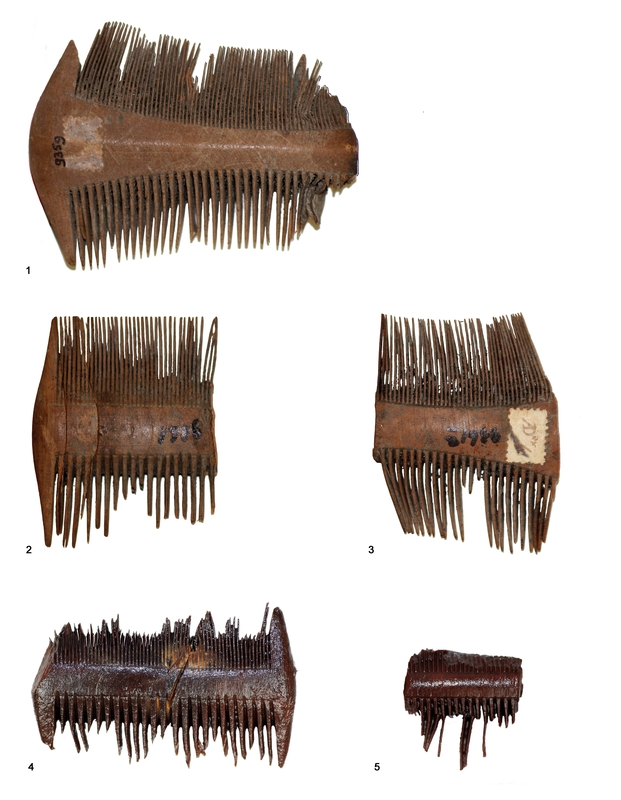 Combs recovered from a Roman Fort. Image Source. Archaeologically lice have been found in Greenland, Iceland, on Dutch combs, Egyptian mummies, and in Israeli cave deposits (Bain 2004). The oldest direct archaeological evidence of head lice are from a human louse egg recovered in Brazil dating to over 10,000 years (Araujo et al 2000). Lice combs (and the lice that come with them!) have been recovered all over the world, in including from sites in Egypt (c. fifth-sixth century AD (Palma 1991)) and Israel (c. first century B.C. – eighth century A.D. (Zias 1988)). They are also routinely recovered at historic archaeological sites. Today to get rid of lice you wash all of your linens in hot water, apply a medicated shampoo to the unlucky individual, and use a very fine-toothed comb to remove any bugs/eggs from the scalp. This comb style is the epitome of “if it ain’t broke don’t fix it” as the general form has remained unchanged for hundreds of years. Our double sided fine tooth comb was produced by the India Rubber Company. “I R Co Goodyear 1851” can be seen stamped on one side of the comb. A similar version is found in the 1895 advertisement seen to the right. 1851 is not a production date, but rather is the patent year for the Goodyear hard rubber vulcanization process (see Amy’s blog post on the comb from the outhouse for more info!). Combs were some of the earliest products made of hard rubber that were produced on a large scale (Fox 1899). This tiny comb provides a glimpse into the health and hygiene routines of MSU’s earliest students. Campus records and diaries/correspondences in the archives discuss larger health related issues on campus (like diphtheria, measles, or typhoid fever outbreaks), the minutia of everyday hygiene habits tends to go unrecorded, but of course, this is where archaeology comes in. 2011 Origin of Clothing Lice Indicates Early clothing Use by Anatomically Modern Humans in Africa. Molecular Biology and Evolution 28(1):29-32. 1991 Ancient Head Lice on a Wooden Comb from Antinoe, Egypt. The Journal of Egyptian Archaeology 77:194. Head lice, Pediculus humanus capitis (Anoplura: Pediculidae) from hair combs excavated in Israel and dated from the first century B.C. to the eighth century. Journal of Medical Entomology 25(6):545-547. 2004 Irritating Intimates: The Archaeoentomology of Lice, Fleas, and Bedbugs. Northeast Historical Archaeology 33:81-90. 2000 Ten Thousand Years of Head Lice Infection. Parasitology Today 16:269. Horseshoe from Brody/Emmons Complex site. No, I’ll stop any speculation; we haven’t uncovered any hand grenades (think of how much paperwork that would be!). But we do have a horseshoe. Now you might be saying, so what? You’ve surely recovered horseshoes before. And yes, that’s true. We have found full and partial horseshoes at a number of locations around campus. However, this horseshoe from the Brody/Emmons Complex (site of East Lansing’s first landfill) never saw a horses hoof. This horseshoe was made specifically for gaming. Although much of archaeological evidence relates to the more routine portions of life, such as cooking, hunting, or household structure, archaeologists have also found evidence of sports and gaming. Artifacts that are believed to be associated with games have been found all over the world, such as these 5,000 year old gaming tokens from Turkey, or evidence of Pre-Columbian ball courts. CAP, however, has not uncovered many sports or game related artifacts. Men playing horseshoes circa. 1942. Image source. 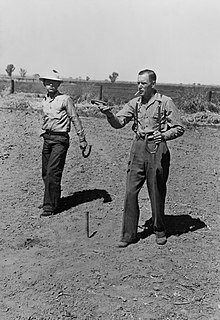 Horseshoes is an outdoors game played between two people, or two teams of two people, using four horseshoes and two targets (stakes) set up in a lawn or sandbox area. Players alternate turns tossing horseshoes at stakes in the ground, which as typically 40 feet apart. There are two ways to score: by throwing the horseshoes nearest to the stake, or by throwing “ringers”. A ringer is when the horseshoe has been thrown in a way that makes it completely encircle the stake. Disputes about the authenticity of a ringer is settled by using a straightedge to touch the end points of the horseshoe, called heel caulks. If the straightedge does not touch the stake, the throw is classified as a ringer. 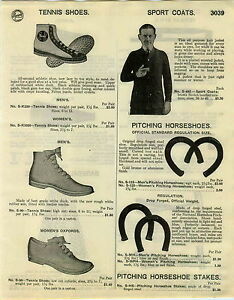 1929 catalog featuring pitching horseshoes. Image source. 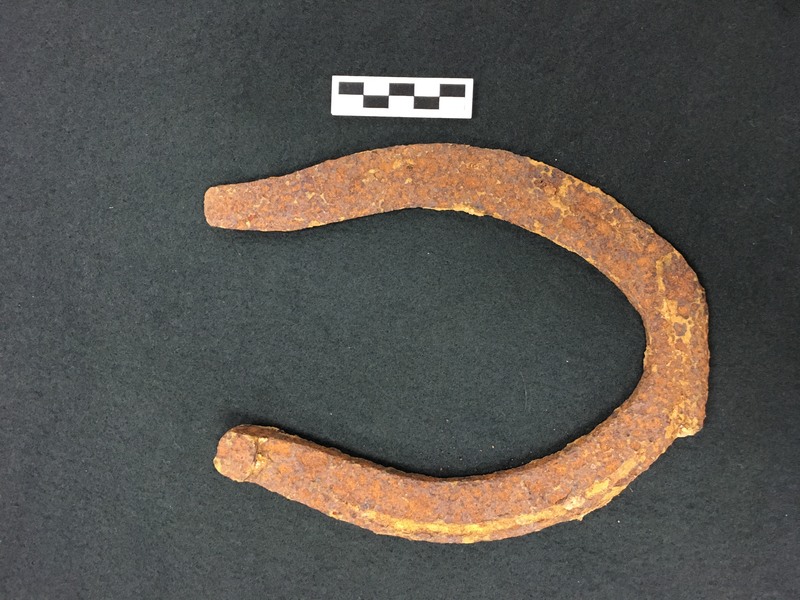 It’s possible that this horseshoe was homemade/handmade, but they were also being sold in kits during the early 1900s. Our horseshoe weights approximately 1 1/2 lbs, but rusting has resulted in some loss. 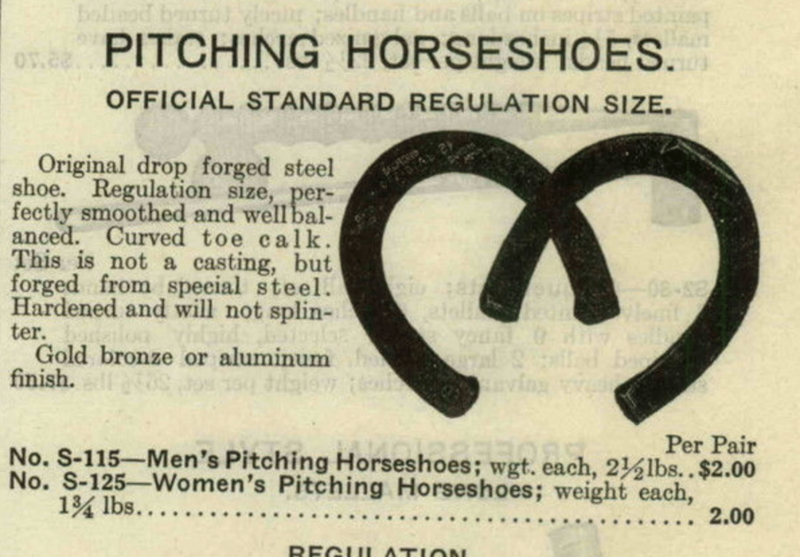 It is interesting to note that the pitching horseshoe catalog entry on the right sells different weights for men’s pitching horseshoes and women’s pitching horseshoes. Since our horseshoe is close to the 1 3/4 lb weight range, it’s possible that this horseshoe was meant to be used by women. Additionally it’s also possible that this horseshoe simply did not meet regulation standards for size and weight requirements. 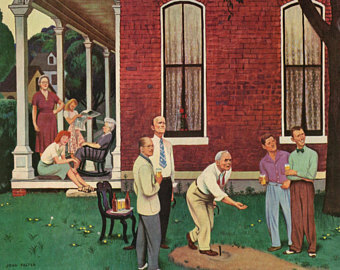 A 1940s beer advertisement showcasing a family playing horseshoes. Image source. The first formal rules for the game were established in England in 1869. However the first recorded tournament in the United States wasn’t until 1909 in Bronson, Kansas. Though the popularity of horseshoes had faded some, yard games are easy to spot today at MSU, especially on game days and at tailgates. Games like corn hole (aka bag toss, sack toss, baggo, and many other regional variations of the name) and ladder toss are easy to spot, but a horseshoe pit is slightly more illusive these days. Although we’ll never know why someone decided to throw away this horseshoe, we’re happy to have found it. This artifact provides an interesting viewpoint into East Lansing’s past.